“How many houses have you been in?” Little Wilhelm looks up at me with his big blue eyes. He sticks his finger up his nose and I knock it away. “I’ve been in three and I’m going to David’s house this weekend.” I hand him a tissue. It’s non sequiturs like this that make me happy to teach Kindergarten. For one, I have not mentioned houses at all. I’m teaching the kids about airplanes in preparation for today’s field trip. And two, Wilhelm has already given up on waiting for my answer; everyone else at the table is bragging about how they have been to SIX houses, or TEN houses, or that their Dad owns FIFTEEN houses because he’s a “really state” agent. I get their attention by showing them the multicolored paper we are going to use to make airplanes. I want to explain the miracle of flight, and connect it to birds and maybe counting. I lead five of them in folding their paper airplanes – they are the five who I’m sure will start their college applications before the advisors ask them to in High School. The other 13 are either folding fans, which we made last week when our air conditioning broke, or crumpling. I take the six crumplers and give them new paper and teach them one by one how to make their planes. Two of the Room Dads take the rest of the kids and either read to them or show them the miracle of paper airplane flight. One Dad, Kyle Weathers, brought a balsa wood plane to throw on the field trip. He’s only 19, and volunteers three or four times a week because he doesn’t have anything else to do. He fits in well, sort of like a giant kindergartner. Last week I had to tell him to allow Lettie (his daughter) and Ronald play with the train by themselves, since he was insisting on reenacting Armageddon. When everyone has a pastel airplane that looks like it might fly, I get our walking ropes and line up each kid behind a Dad and attach them to one another by the rope. Everyone has a walking buddy. If one of them, for whatever reason, forgets to hold the rope and wander off, someone else will catch them and bring them back, like an ADHD insured trust fall. The field trip is honestly just an excuse to go outside. I like being out in the world with the kids. They have questions, I can answer them. If I can’t, I’ll try to teach them about it in the coming weeks. Trips outside make the kids smile, and gets them to sit quietly for about an hour when we get back. And we always bring our snacks along, which I have in my hiking backpack. I have to slow Kyle down a couple times. His six kids, including Lettie, are sprinting behind him and keep raising dust on the path. He slows and passes me a chocolate chip cookie he had in his pocket. “My girlfriend baked these, I think you’ll get a kick out of â€˜em.” Kyle’s is 18 and works at a bakery to support them. I want to ask Kyle why he doesn’t work, but I can’t think of a way to word the question that doesn’t imply he’s lazy and irresponsible. We get to a nice little lookout point and Marcie, one of the crumplers, asks, “Where do all the clouds go when the sky’s clear?” And I don’t know so I just let the question hang. I’m worried that another kid will ask why the sky is blue, which is a clichÃ© for a reason. I forgot the answer a long time ago, and I don’t want to be zero for two. The class eats snacks on the ledge, and I eat Kyle’s girlfriend’s cookie. It’s straightforward chocolate chip, a little bit crumbly. Underneath is a napkin, and I wipe the edges of my mouth before wiping Gary’s chin, which has banana on it, even though he wasn’t eating banana. The napkin has writing on it, and through the banana and chocolate smears, I see Kyle’s girlfriend wrote, “Have a nice day, honey. Enjoy the trip down the rabbit hole.” And my heart skips a beat because I’m worried what that might mean. I tell the kids to stay put and I scramble up to the higher ledge where Kyle’s kids are all chewing and fighting one another, and ask him. I try to remember that Kyle means well, in his giant old man glasses without lenses in the frames. I want to push him for putting me and the kids in danger, but I hold myself back. I tell Rick, the other Room Dad, to watch my group because I feel sick, and I wanderÂ off. His kids are all bored to tears, listening to him wax nostalgic on software programming. I run around thinking that if I just keep my heart rate up, I can help the THC complete its stoner course through my body. But then I lie down, because I’m worried I’ll fall of the ledge. I sit down cross-legged. 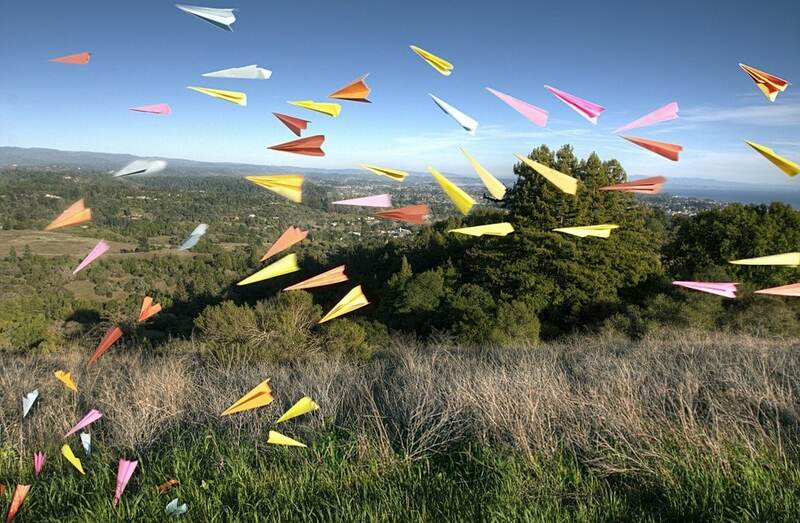 I watch a dozen paper airplanes float through my line of sight, and pretend like there are a dozen more, on an endless loop. Hundreds of simple pieces of paper experiencing lift and low level air pressure. I wonder what I’m going to do when we have to go back inside, and then I wonder, for what seems like a long time, how many houses I’ve been in. Posted on Sunday April 17th, 2011 Wednesday March 26th, 2014 by Max Elman. This entry was posted in Photos & Stories and tagged airplanes, children, cookies, kindergarten. Bookmark the permalink.